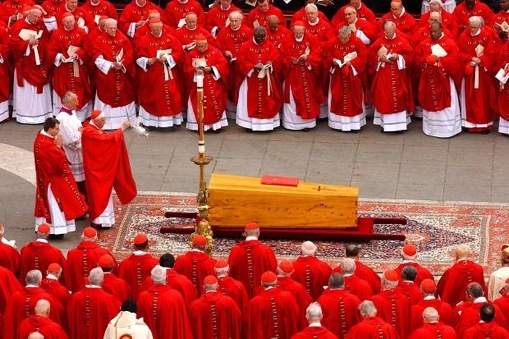 Note to readers: Network television's mass convergence on the Papal Conclave this week reminded me of the majestic funeral of Pope John Paul II and its live, very early morning coverage in the U.S. This account was first published on April 9, 2005. When in Rome, turn back the clock to the ungodly hour of 3 a.m. (central time) for the funeral of Pope John Paul II. Major broadcast and cable news networks answered a higher calling anyway, providing live, commercial-free coverage Friday from a glorious, sunlit setting in St. Peter's Square. Most Americans no doubt opted to catch replays or highlights. Those moved to witness history as it happened were best served when anchors and commentators fell eloquently silent in deference to the stirring sights and sounds enveloping the first true "television pope." None was more powerful than his symbolic final bow at 5:40 a.m. (12:40 p.m. in Rome). Pallbearers tilted the pope's unadorned wooden casket downward to sustained applause from a crowd estimated at 100,000. Bells tolled, tears flowed. Fox News Channel further commemorated the emotion of the moment with a memorable shot of a young man weeping openly and unabashedly. People from around the world rose magnificently and attentively to this occasion. For once, no one seemed to be playing to TV's cameras, whether in Rome, the pope's native Poland, Mexico City or on sleeping bags while watching the service from inside Sacred Heart University in Fairfield, Conn. Networks leaned on translators and an array of priests, monsignors and bishops to help with the basics of this unprecedented, firsthand look at a pope's funeral. ABC generally had the most affecting close-ups of individual mourners. Otherwise the network's intrusively talkative coverage, anchored by Charles Gibson, Cokie Roberts and the Rev. Keith Pecklers, repeatedly did a disservice to the service. Some viewers perhaps shouted "Amen!" when Gibson said at one point, "We will just watch and listen for a little while." Too often, though, the Mass seemed beside the point, as when Gibson said, "Father Pecklers, take us back to the service." He did so, for a half-minute maybe, before Gibson turned to Terry Moran for a street-level report. Rival networks, including Telemundo ("El funeral Juan Pablo II"), were souls of discretion in comparison, with on-site CBS anchor Harry Smith and company placing a distant runner-up in the chatter derby. All of the networks got gabby, though, during the 20 minutes it took to distribute Holy Communion. Shortly after 5 a.m., with the funeral in its climactic stages, Fort Worth-based KXAS-TV (Channel 5) periodically shrunk the screen to offer mood-breaking printed news bulletins such as "N. TX. man has cardiac arrest; drives into house" and "Irving man took son on murder spree; gets death." This was the networks' first pre-dawn live coverage since the Sept. 6,1997 funeral of Princess Diana, which started at 5 a.m. on Saturday. It also was the first major news event of roughly the last quarter-century without any role for Tom Brokaw, Dan Rather or Peter Jennings. Brokaw retired in December as anchor of the NBC Nightly News, and Rather left the CBS Evening News last month. Jennings, still anchor of ABC's World News Tonight, announced earlier this week that he's undergoing treatment for lung cancer. Gibson graciously ended ABC's coverage by wishing Jennings well. "Peter, it has been an honor to broadcast here in your stead," he said.